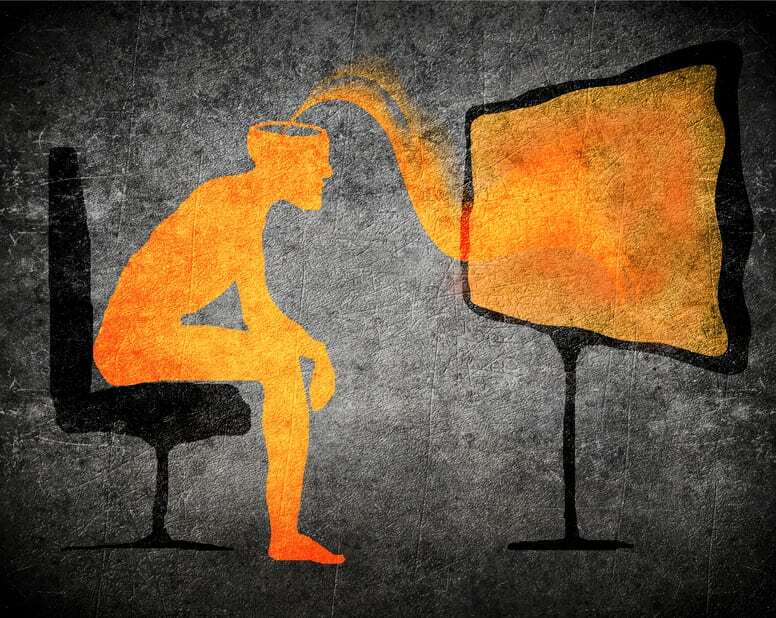 The hospital-media partnership: promoting public health or inducing public demand? Following is a guest post from Dr. Saurabh Jha, a radiologist at the University of Pennsylvania who recently joined the HealthNewsReview.org team. He is active on Twitter under the handle @RogueRad. The views he expresses are his own and do not reflect the views of his employer. When I was seven, my mother told me that Sunil Gavaskar, an Indian cricketer I admired, ate broccoli every day. She lied. I now hate broccoli, viscerally. Mothers are known to confabulate about celebrities. Hospitals are not celebrities, but their endorsement of a healthy activity has gravitas. It is one thing for the ever-excitable Silicon Valley to endorse a wearable technology device like the Apple Watch, but if Johns Hopkins Hospital, for example, endorses that device, the message is much more powerful. A prestigious hospital exudes not just credence but sincerity. 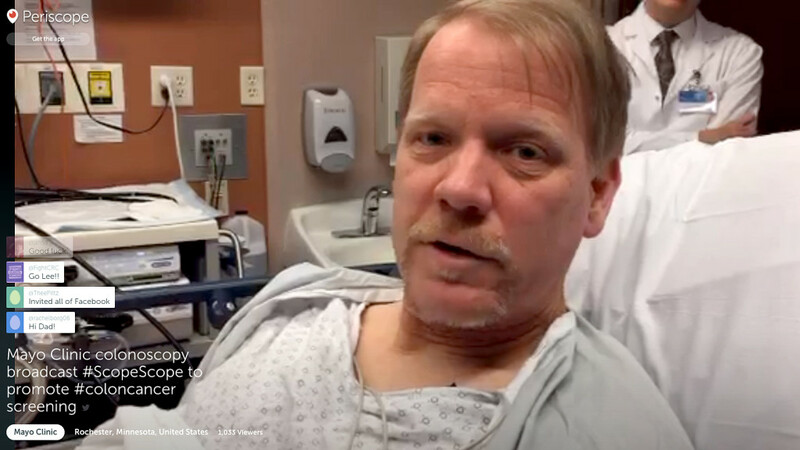 Hospitals can reach people through the media. 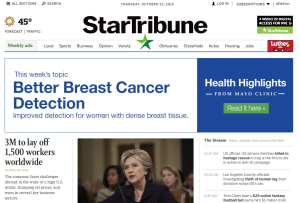 Mayo Clinic has a content partnership with the local Minneapolis Star Tribune. 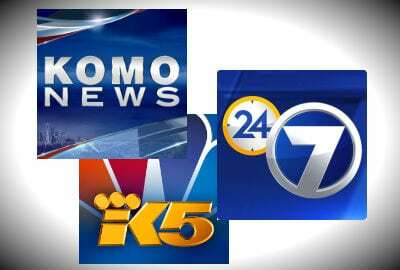 The newspaper has sold Mayo space to deliver health-promoting messages to the public at large. Plausibly, such a partnership is a win-win for everyone. The suburbanite gets a dose of preventive health advice, along with entertaining gossip, in their daily read. Hospitals, for a change, improve the public health rather than fight sickness. The newspaper gets the satisfaction of contributing to the public good. However, in reality some gain more from this partnership than others. 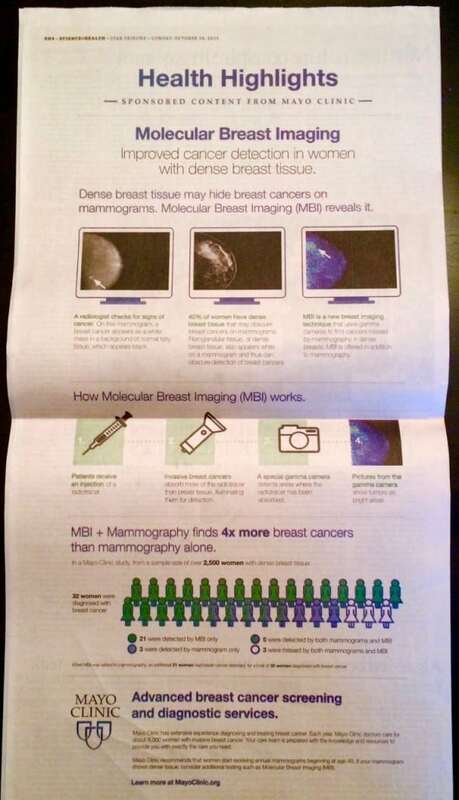 The Star Tribune has featured a full-page infographic which advertises an emerging technology to detect breast cancer called molecular breast imaging (MBI). (See image below and click for larger view.) In the infographic, women are told that dense breast tissue can hide cancer; that 40% of women have dense breast tissue; that mammograms may miss cancer in dense breasts; and that MBI detects many more cancers than mammograms. To see the Clinic parading the limitations of mammograms so publicly is somewhat ironic. When the American Cancer Society recommended that most women delay getting mammograms until age 45, up from age 40, Mayo issued a news release that emphasized the benefits of mammograms, and continued to advocate strongly for mammograms for all women in their 40s. According to the quoted Mayo physician, “Overall, the new ACS recommendations reaffirm that screening mammography for women in their 40s is associated with a decrease in breast cancer deaths.” Does this include the 40% of women who have dense breast tissue hiding cancers? The infographic is a tapestry of partial truths — nothing said is a flat-out lie. Take one figure: 40% of women have dense breast tissue. This is correct but not all breast tissue is equally dense – dense breast tissue is classified as “extremely dense” or “heterogeneously dense”. Cancers are better hidden in extremely dense breast tissue than in heterogeneously dense breast tissue. Without this nuance, the infographic is still accurate but misleading. Given the limited space, the infographic cannot mention every vital nuance, such as the fact that MBI hasn’t been proven in a well-designed randomized controlled trial, and that finding more cancers does not necessarily improve survival because of incontestable realities such as lead time bias and overdiagnosis. An infographic cannot lecture about the nuances of tumor biology. The public will tune out. To be fair, such granular knowledge eludes many physicians as well. This raises a question: When a message is so dependent on nuances, should that message be delivered to the masses in a format where it must be stripped of those nuances? It is easy for a cynic to conclude that Mayo’s partnership with the Star Tribune is not so much to improve public health but to increase revenues from expensive technology. The infographic implies that 40% of women could benefit from MBI, which Mayo performs and performs well. This could induce demand for MBI. Mayo might object that a confluence of interest is not necessarily bad, that the public has a right to know about the best technology available, and that the breast density law mandates that women with dense breast tissue be told about the limitations of mammograms (this is true but the law mandates this information be given after, not before, the mammogram shows dense breast tissue). Nevertheless, it is easy to cross that fine line between health promotion and direct-to-consumer advertising (DTCA). Mayo’s infomercial is sweetened with unbridled optimism, which pharma would not get away with in their DTCAs – pharma must mention the side effects of their drugs. There is nothing unusual in hospitals advertising expensive technologies, such as on the cover of in-flight magazines and on billboards on interstates. I once saw two billboards next to each other on an interstate. One was from a local hospital advertising the latest CAT scanner which could see life-threatening narrowing in coronary arteries. The next billboard had a picture of a medical injury lawyer. He had a smug look on his face, and his hair was perfectly combed. There are many legitimate methods of practicing sub-prime consumerism in healthcare. These messages won’t generate revenue for the hospital. But revenue is not the goal of this noble partnership, is it? Proton beam: should a news organization “partner” with providers to promote in the face of intense debate? The Overdiagnosis Issue of the journal Academic Radiology edited by Jha. You need a subscription to read everything in it, but at least you can see the index of subjects covered.